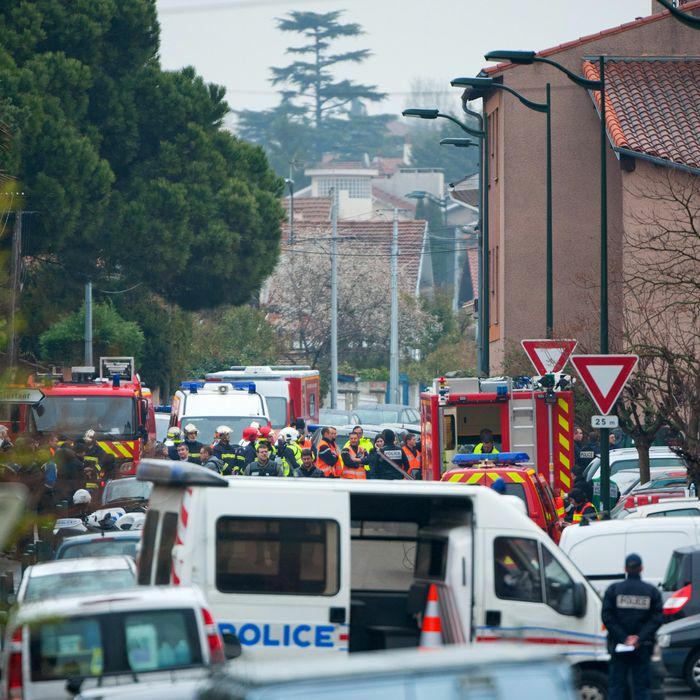 Unconfirmed reports are coming out of the southern French city of Toulouse that Mohamed Merah, the 24-year-old French Algerian suspected of killing four people outside a Jewish school as well as three French paratroopers, was arrested in the past hour. The news, since retracted by French BFM TV, comes after a twelve-hour standoff in a five-story apartment block, where Merah holed up after a brief gunfight outside his front door in the early hours of the morning that left three police officers wounded. Within minutes of the initial face off, hundreds of riot police quickly descended on the area, evacuated the building with fire truck ladders, and waited for a communication channel to be opened with Merah — the self-proclaimed al Qaeda-affiliated “mujahideen” fighter had to throw a Colt .45 handgun out the window before police would agree to negotiations. The French interior minister later acknowledged that Merah, who was (not, it seems) arrested in Kandahar, Afghanistan in late 2007 for planting bombs before escaping in a Taliban-orchestrated mass breakout, told police negotiators he killed the rabbi and three Jewish students because “he wants to avenge the deaths of Palestinians.” While “less explicit” over the killing of the paratroopers, the minister said Merah was “after the army” for its “crimes” in Afghanistan — in fact, two of the soldiers had served in Afghanistan, where the French still have some 3,600 troops. (French newspaper Liberation reports that Merah tried to enlist with the French military twice, both times unsuccessfully, and was planning to kill another soldier today.) Merah also told an editor with TV channel France 24 that his actions were in protest of the French headscarf ban, something federal prosecutors said he later repeated to negotiators. The French government is now under intense pressure to explain itself, after it was revealed that authorities have been watching Merah for years, concerned over his “fundamentalist” beliefs. Officials maintain there was no indication Merah (who already has his own Wikipedia entry) was planning the horrific attacks of the past two weeks. But the government was not alone in being surprised. French newspaper Le Journal du Dimanche interviewed two of Merah’s friends, also French nationals of Algerian origin, who said they’d run into him Saturday and that “he was in high spirits.” Just the week before he’d been seen with a friend at a Toulouse nightclub. He was “very fashion,” they said of Merah, who for the past two years has worked in a body shop. “He loved speed and beautiful cars, like the rest of us.” Below a video that TV channel France 2 claims showed Merah joyriding with friends. Etelin, for his part, did admit to learning two years ago that Merah had been radicalized in Afghanistan, after which he told Merah that he was probably already under surveillance. At the moment, the standoff continues. Merah’s mother and several other family members are in custody, including his brother who French authorities say “is engaged in the Salafist ideology” and whose car was discovered filled with explosives. As for Merah, he remains in contact with police, despite having pledged to surrender himself by 9:30 in the morning (EST), a deadline now hours past. (BFM TV says he is now on the ground floor of the building.) As night set on Toulouse and Merah still not surrendering, the authorities shut off all the neighborhood lights — they had already shut off electricity and gas to Merah’s building — while the huddled, semi-frozen journalists outside tweet hopefully of an imminent raid and the difficulty of recharging their iPhones.